We flew SKY from Puerto Montt to Punta Arenas, a flight of a little over two hours. SKY is the budget airline of South America, and it felt like it. So it was good to get off the plane. We met Kris, our local guide, and got on our bus. On the way into the city we made a stop at the Nau Victoria Museum. Punta Arenas lies at 53 south latitude, equivalent to the Aleutian Islands (at 53 north). Over the course of the afternoon and evening we have spent here, we’ve had sleet, snow, rain, sun, and lots of wind. The HMS Beagle, which conducted two surveying expeditions to South America. The first, between 1826 and 1830, helped map navigable waters in southern Patagonia, including the Beagle Channel. The second, from 1831 to 1836, included Charles Darwin among its passengers. On this trip the Beagle circumnavigated the globe, including a stop in the Galapagos Islands. The Ancud was built in the city that bears its name (and where we spent the last two nights). It sailed to the Strait of Magellan in 1843 with the purpose of claiming Chilean sovereignty over that waterway. They arrived there just two days ahead of the French! The James Caird, a lifeboat of James Shackleton’s ship Endurance. Shackleton used this small boat to rescue the ship’s crew, stranded on Elephant Island after Endurance sank in icy seas. They sailed in this boat from Elephant Island to South Georgia Island, a journey in treacherous waters of over 800 nautical miles that lasted 16 days. Our hotel sits right in the heart of Punta Arenas. After check‐in we had plenty of time to explore. I went out on my own and walked around the Plaza des Armas. I was really taken by the interesting architecture, a mix of styles reflecting what was clearly a wealthy history in the area. Cathedral of Punta Arenas. The first cathedral, built in 1892, burned down 4 months after it was inaugurated. This one was completed nine years later. Palacio Sara Braun, home of one of the most important residents of Punta Arenas. Federico made a reservation for the group at what turned out to be a fabulous restaurant. I ate guanaco, because guanaco! (Tomorrow we will probably see some guanaco.) It wasn’t the best meat I’ve ever eaten, but it’s always fun trying new regional foods. Overall, it was one of the most enjoyable meals of the trip, and the restaurant was funky and fun. That was pretty much the full extent of our time in Punta Arenas. On Sunday we have an early start and head north to Torres del Paine National Park. We are staying at a lodge in the park, which may mean slow Internet, so I’m not sure how much I’ll be able to stay in touch from there. 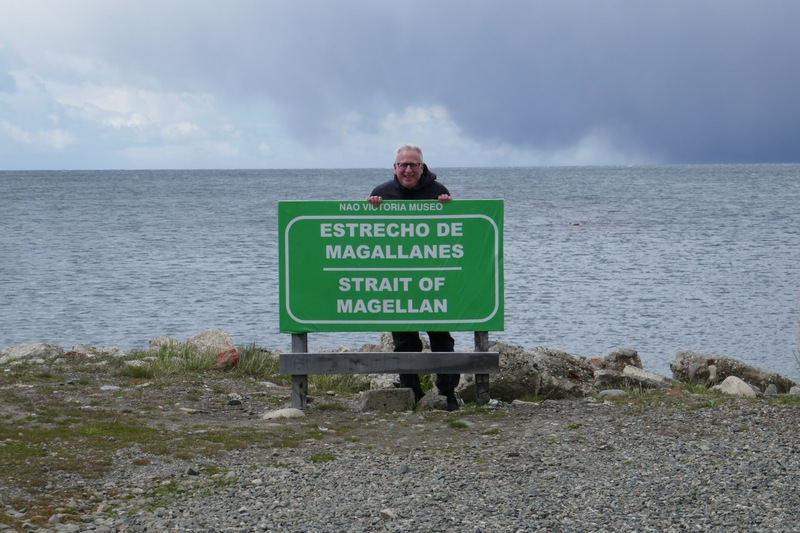 This seems like a pretty dull post, though Punta Arenas wasn’t dull. I liked it. From a tour itinerary perspective, it seemed to serve only as a transportation hub. To get from central Patagonia to southern Patagonia, fly to Punta Arenas, and then leave early the next morning. But also, Kris didn’t actually have much to tell us to add interest. She is not from Punta Arenas; she lives in Puerto Natales, about three hours north of here. I hope she is more eloquent in talking about our drive tomorrow and and the national park. One thing she did tell us about was the war that almost broke out in 1978 between Chile and Argentina. It seems there are three small islands in the Beagle Channel just south of Tierra del Fuego. These islands belong to Chile, but there was a long‐standing dispute. In 1971 Argentina and Chile agreed to settle the dispute via binding arbitration under the auspices of the British. When the ruling came down in 1977 (that the islands belong to Chile), the military junta that was at the time in control of Argentina decided to flex its muscle. They were on the verge of attacking, but a storm led to a two‐day delay, which was enough time for the Vatican to intercede. The emissary who brokered the peace was Cardinal Antonio Samoré, after whom the border crossing (where we crossed from Argentina to Chile a few days ago) was named. The other thing Kris told us about was Difunta Correa. The story goes that in the 1840s, during the Argentine civil wars, this woman’s husband was forcibly recruited to fight with the partisans. When he fell ill, she traveled with her newborn baby to try to help him, but she died during the journey. Days later her body was found by gauchos, and the baby was still feeding at her breast. Roadside altar for Difunta Correa. People leave bottles of water to calm her eternal thirst.